Synopsis : Haunted by memories of her dead sister and childhood home, Reva meets her sister’s then-boyfriend, Suveer, every year for a day in a friendship that seems to offer each of them a way to come to terms with the past. Suveer is reporting an election story of ‘dishousing’ on a bungalow belonging to a Muslim businessman in a Hindu-dominated area of Gandhinagar. Unable to remain objective when the mob turns on Mahnoor, a young Muslim woman, he is beaten up and hospitalised. Without a second thought Reva leaves her husband and goes to him. Suveer and Reva seek shelter with Mahnoor and her husband, Zahyan, who find the life they’d painstakingly constructed is slowly unraveling. This gripping story asks the question: where is home? Reva and Suveer, Zahyan and Mahnoor, be it in circumstances of love or loss, ever seek a path to return by. My view : Please don’t judge me but I am really really fond of beautiful covers and I knew I had to read this once I was infatuated by the cover. The pretty blue window with half broken glass pane and pieces of paper boards stuffed into it to block the light is one of those common sights one can catch in any suburban neighbourhood houses. It is so real and enticing that you are drawn to the words hidden beneath the cover. Reva and Aboli were cousins who shared more than a home. They shared a beautiful childhood with memories that are so special that they come back into the blank recesses of her life and brings a sharp ache in her heart, reminding her starkly of how different things have become. Haven’t we all faced this dilemma of leaving behind a part of us when we move to a new place or a new phase of life. Reva not only misses her sister after her death but also the person she herself used to be when they were younger. The house was an integral part of her childhood and along with Aboli, the feeling of being at home too vanishes from Reva’s life. Suveer, a journalist for a leading media house finds himself at fix when he attempts to rescue Mahnoor, a Muslim young women living in a rigid Hindu locality with her husband, Zahyan. When a harmless person is victimised in the name of religion by barbarous bigots, faith in humanity seems a distant dream. We witness how brutal we as collective humans are and how this brutality forces innocent young people to be provoked into doing acts of terrorism. Yet in the midst of violence and savageness there is a yearning, a deep desire for love. Reva and Suveer’s longing for each other is so beautiful yet maimed by the inevitable circumstances. There is a blueprint forming that swiftly changes with slight alterations with every relationship. A blueprint of love, of a home. This book is so intensely emotional that it tore me up quite a few times. The characters are so vividly layered and their reactions and emotions so sincere that you will feel yourself intricately involved within the book. Zahyan’s struggle to fight for his wife’s justice and his protective nature towards her complements Mahnoor’s concern and love for him. There question “where is home?” hangs crucially midair with no real answer while the search for homes an continues in life. A Blueprint for Love is more beautiful than its cover page. The book flows like a mellow river through the tough and harsh rocks, yet but losing its gentleness in any way. The pages like the clear water in the river reflects our life’s perplexities and dilemmas. 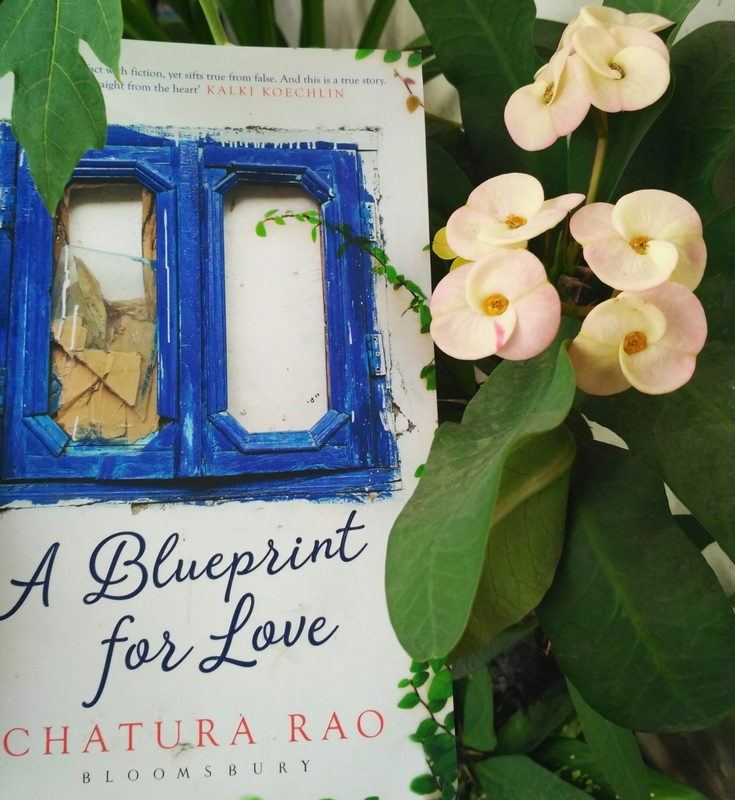 Chatura Rao does not lose her magical touch even once throughout the whole story and her book is more than writing; it is art spilled from the tips of her quill, waiting to be appreciated. Thanks 🙂 you will love the book.